Tonight I went to the carvery with friends after having not been since the beginning of the summer. I used to love going out for Sunday lunch every week with either family or friends but with having a job in retail it is very hard to find the time to do that anymore. 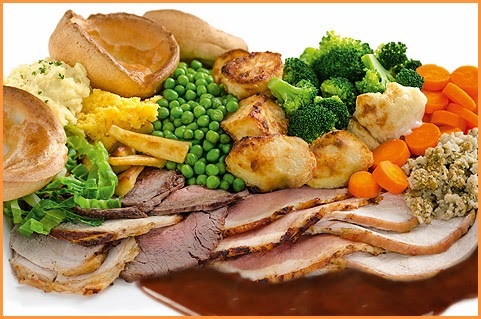 So I jumped at the chance to go and have a carvery, it saved me cooking any tea after work too. The aroma of all the different meats, gravy and vegetables hit my nostrils as I walked into the pub and made my mouth water. I could not wait to eat, I ordered an extra large carvery which meant I got more meat and all importantly an extra large yorkshire pudding. I enjoyed the company of the people I was with, especially because I got judged for having too little on my plate. everyone elses was piled high with food because their eyes were bigger than their belly. I just about managed to finish all my food and even just had room for some pudding. It is safe to say I am now stuffed and don't feel like eating for a week. I will definitely be trying to make more time to visit the carvery from now on tho.